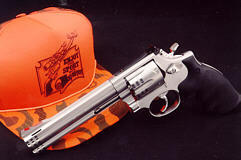 The growth of handgun related sports has let to various options for recoil and muzzle lift reduction. 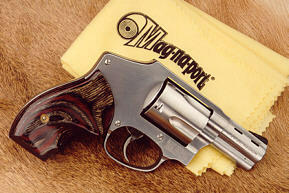 Today Mag-na-port offers the traditional revolver porting, rifle porting, dual trapezoidal porting, and quadporting. The variety of handgun porting allows the shooter an option best suited for their needs. Handgun recoil, more specifically felt recoil is perceived differently by individual shooters. The less experienced shooter will be more aware of the lessening of felt recoil in a gun that has been Mag-na-ported. The degree of change in a handgun's shooting characteristics, subsequent to Mag-na-porting, depends upon many factors: barrel length, weight and to mention the most critical, load. 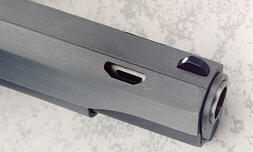 Traditional Mag-na-porting of a handgun consists of two trapezoidal ports cut into the barrel approximately 1/2 inch from the muzzle. These ports are placed at approximately 35 to 45 degree angles. For the shooter this translates into a reduction of perceived recoil of 15 to 20%! Rifle style Mag-na-porting consists of two traditional trapezoidal ports and two oval ports cut into the sides of the barrel. This style of porting is available on barrels of 7 1/2 inches or longer and recommended for the handgun hunter and larger calibers. 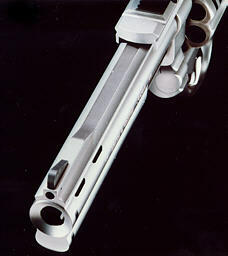 The side ports help by providing additional reduction in recoil and aid in barrel stability. Dual Trapezoidal Mag-na-porting is designed for shooters using shorter barrels with a minimum length of 3 inches. This style of porting provides greater relief from muzzle lift. Using two trapezoidal ports on each side of the barrel, the primary focus of gas dissipation helps reduce the muzzle lift. Extremely effective on the snub nose magnum revolvers. Quadport is designed especially for the 2 1/2 inch S & W barrels or shorter SP 101's to help control the upward pressure on these light weight firearms. 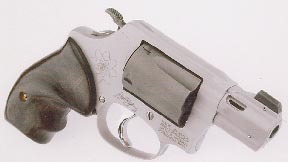 Consisting of two small oval ports cut into the barrel, this style of porting was designed exclusively for the short barreled revolvers popular for close range shooting. The Mag-na-port process does not, in itself, alter a handgun's accuracy. The improvement comes from the shooter's being more comfortable, and able to return the gun to a firing position more quickly because of softer recoil. It is this characteristic that is responsible for the popularity of Mag-na-porting amongst law enforcement personnel and competitive shooters. A number of chronograph tests have been conducted over the years. It has been proven, time and again, that Mag-na-porting does not influence velocities to any meaningful extent. Whatever your particular interest, the experts agree Mag-na-porting will improve your shooting, and make it more enjoyable. Mag-na-port offers a unique system of porting semi-automatics by using a trapezoidal port through the barrel and an oversized expansion vent through the slide to allow maximum dissipation without fouling. This process offers an alternative to shooters not wanting additonal weight or length from add on compensators. Shooters using Mag-na-port's "autoporting" services do not experience the large flash of muzzle blast experienced with systems dumping larger volumes of gases through holes positioned across the center line. Law enforcement agencies and companies offering night sights have tested our porting service finding no increase in muzzle blast or night blindness attributed to our porting service. It's amazing what a difference two trapezoidal slots can make! The wrist-wrenching recoil of a 10mm is controlled through Mag-na-porting making it feel more like an unported .45 ACP. The reduction in muzzle rise and felt recoil allows the 10mm to be brought back on target in less time, which could be crucial in a firefight. Autoporting will make the gun more manageable and much more pleasant to shoot. On lighter calibers such as the 9mm, shooters find their primary benefit gained by autoporting will be the reduction in muzzle jump. The advantage gained by autoporting just might be enough to make a real difference in a crucial situation where quick repeat shot is needed. Text & Pictures Copyright 1996-2019 © Mag-na-port International, Inc.